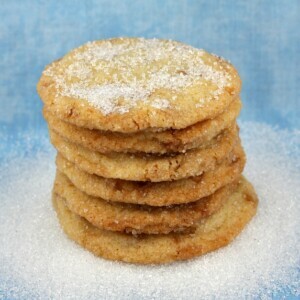 These Sparkling Butter Toffee Cookies are delicious butter cookies with toffee bits mixed in and then rolled in sugar. This cookie stays soft-ish and doesn’t turn crispy like some cookies do after a day or two. Using Bright White Sparkling Sugar (found at craft stores and baking supply stores) is what gives these cookies their sparkle. They're simple to make. That wonderful flavor of toffee is tucked into a sugar cookie. Heat oven to 350°F. Line cookie sheets with parchment paper or silpat mats (or leave them ungreased). Combine sugar, butter, egg and vanilla in a large bowl. Beat at medium speed, scraping bowl often until creamy. In a small bowl, whisk together flour, baking powder and baking soda. Add to wet mixture and beat until well mixed. Stir in toffee bits by hand. Shape dough into 1-inch balls. Roll in sugar. Place 2-inches apart onto prepared cookie sheets. Flatten each with bottom of a glass to 1 1/2-inch circles (if glass sticks, dip in sugar). Bake 9 to 11 minutes or until edges are just lightly browned. Do not overbake. Sprinkle with additional sugar while warm. Cool completely. This is a great cookie for shipping- it travels well. Toffee bits are available in most market's baking aisles (near the chocolate chips). 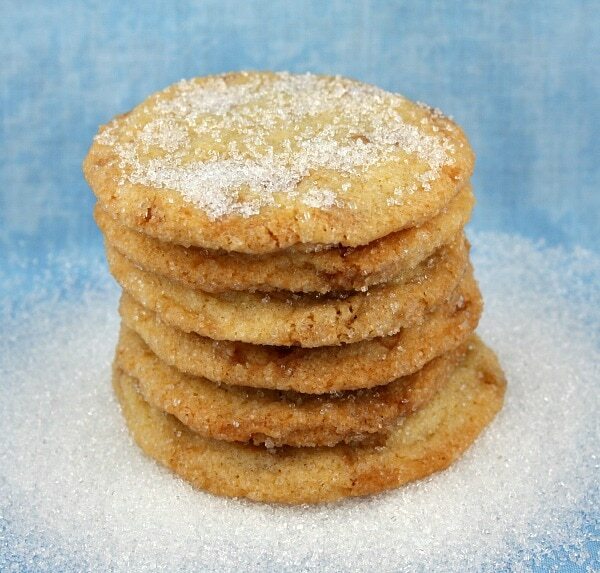 To really make these cookies sparkly, use "Bright White Sparkling Sugar"- which can be found in cooking supply stores. Stud a few additional toffee chips into the tops of the cookies before baking if you would like them to be more visible in the baked cookie.